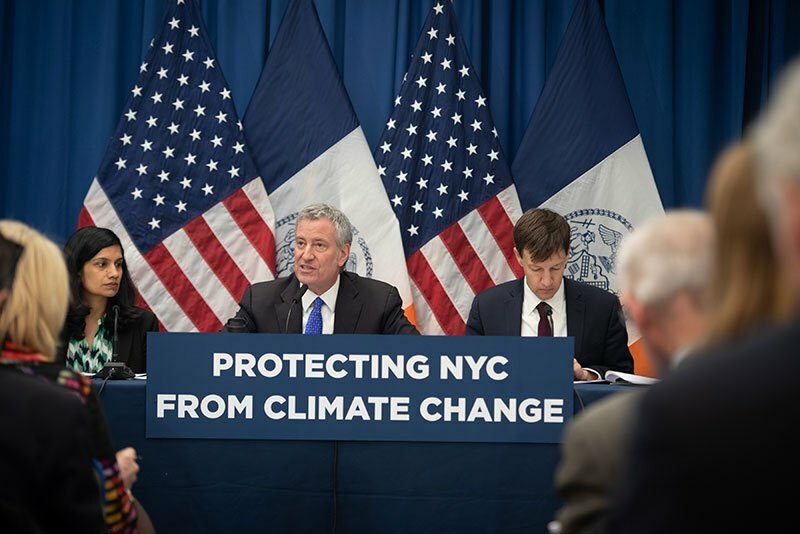 ‍‍On March 14, 2019, Mayor Bill de Blasio announced the Lower Manhattan Coastal Resiliency (LMCR) Project. The project is one of the City’s responses to the aftermath of Hurricane Sandy. Hurricane Sandy was a turning point for the City to tackle infrastructure resiliency. Hurricane Sandy resulted in $19 billion of devastation for the City and particularly impacted Lower Manhattan. The storm resulted in power outages and flooding in homes, businesses, and tunnels. Since Hurricane Sandy, the City has worked to assess Lower Manhattan’s climate change impacts and risks and analyze coastal protection options for the area’s 3.3-mile shoreline. The Lower Manhattan Coastal Resiliency Project was developed from the Lower Manhattan Climate Resilience Study. The study evaluated dozens of adaptation measures and identified a set of strategies to build resilience for Lower Manhattan based on City’s climate change projections until 2100. The study projected that by the 2050s, 37 percent of Lower Manhattan properties will be at risk from storm surge. The study also stated that there will be over six feet of projected sea level rise by 2100. As a result, almost 50 percent of Lower Manhattan properties will be at risk from storm surge and 20 percent of Lower Manhattan streets will be exposed to daily tidal flooding. The study also showed that groundwater table rise is projected to put seven percent of buildings at risk of destabilization and expose 39 percent of streets with underground utilities to corrosion and water infiltration. The City used the study’s findings to develop recommendations for the LMCR project. From the study, the City recommends expanding the Lower Manhattan shoreline into the East River to protect the Seaport and Financial District areas. The unique characteristics of the Seaport and Financial District areas make using more traditional on-land floor protections measures infeasible. The areas have low-lying topography, a lack of available space, dense infrastructure above and below ground, an active waterfront, and are constrained by the FDR Drive, Battery Tunnel, and the A/C subway tunnels. The shoreline extension will create a new piece of land with highpoints at or above 20 feet from current sea-level. The new shoreline will act as a flood barrier during storms and protect the neighborhoods against projected sea-level rise. It may be extended anywhere from 50 feet to 500 feet; however, the exact extent of the new shoreline, as well as its design and construction, will be determined through a public engagement process. The Mayor’s Office Recovery and Resiliency (ORR) and the New York City Economic Development Corporation (NYCEDC) will complete a Financial District and Seaport Resilience Master Plan, which will include a comprehensive design for the shoreline extension and establish a new public-benefit corporation to finance, construct, and manage it. The City will immediately procure a team of engineers and designers through a Request for Qualification RFQ later in March of 2019 to start the shoreline extension. The Master Planning Process will be complete in 2021 and will identify a first phase project. A $3.5 million project to deploy a combination of just-in-time Tiger Dams and pre-deployed HESCO flood barriers for the South Street Seaport area, parts of the Financial District and Two Bridges neighborhoods as temporary measures in advance of a permanent solution for the 2019 hurricane season. The design for the projects began on March 14, 2019 and will be in construction by 2021. The City will begin a community engagement process in the spring of 2019 to discuss the Lower Manhattan Climate Resilience Study, its strategies, investments, and further planning. Community outreach programs will be scheduled for each of the capital projects and the Financial District and Seaport Climate Resilience Master Plan.